The screw machine industry has weathered a number of challenges in recent years, and in spite of global competition, many U.S. Based companies are discovering that optimizing some of their early and late model Acme-Gridley screw machines is an inexpensive alternative to buying a new machine. The most important step in the optimization process is to team up with an innovative Screw Machine Rebuilder. BME understands the benefit of incremental productivity enhancements in the tool zone, that’s why they turned to Logan Clutch for help on the machine end of the rebuild process. “When we visited with customers on their shop floor, we could see how a machine equipped with Logan Hi-Lo Retrokit Clutches and Controls would totally outperform their other Acmes.” says May. Smooth, fast acting air actuated clutches in the Logan Retrokit are much more reliable than conventional mechanical clutches, and significantly reduce the cycle time on any part being made on the machine. The CS2001 control eliminates relay logic, and enables further cycle time reduction in 1-degree increments. The easy to read screen dramatically simplifies set-up. Brett continues, “If they can operate a CNC machine, they can also run an Acme”. 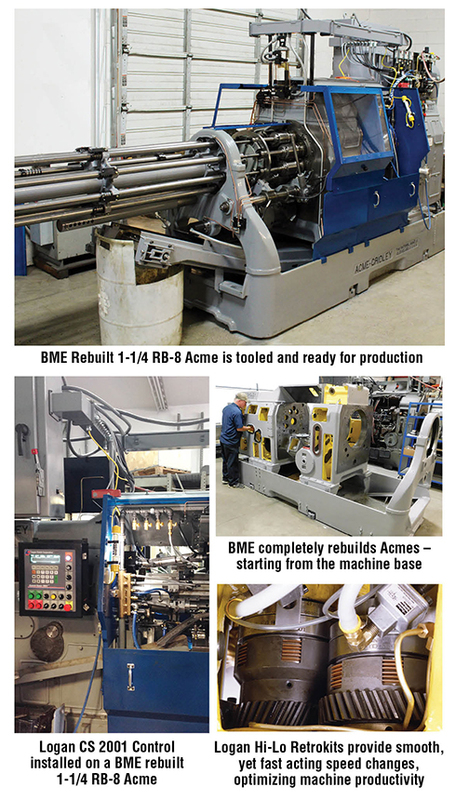 BME recently rebuilt an Acme 1-1/4 RB-8 with spindle stopping, for a job shop that needed to keep up with demand for a popular part. Prior to the rebuild, the shop was paying overtime and also used an outside supplier to make additional parts. The existing machine was run at a slower cycle to avoid the risk of crashing tools during speed changes. With the rebuilt machine using a Logan Hi Lo Retrokit and CS2001 control, the slow cycle and tool breakage risk was eliminated (due to consistent Logan Clutch speed changes). The cycle time of the part was reduced from 13.5 to 9 seconds, a 33% reduction in cycle time, leading to a huge boost in productivity. Overtime and outsourcing was no longer required to meet customer deliveries. The return on the Investment (ROI) on the BME rebuild was also a huge boost to the job shops top and bottom line. Other benefits of the Logan Control that the customer highlighted were the tapping failure detection and the machine lock-up detection. Plans are underway to rebuild more machines. Logan Clutch appreciates the valuable partnership that it has with BME and their ability to integrate Logan products with their capabilities to help customers reduce costs and improve productivity.